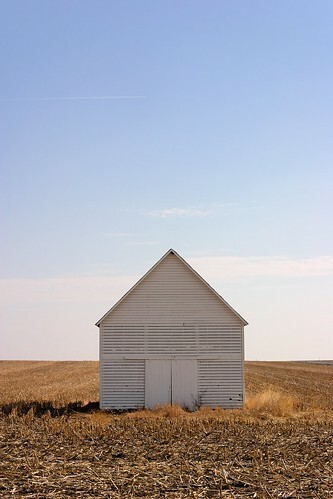 White Corn Crib [West Central Iowa], posted by Matt Niebuhr. Found along Highway 141 – just west of Perry, IA. A bright sunny early spring afternoon – just before the field is turned for this year’s crop. This crib is nicely kept up by someone. It’s difficult to tell from the surrounding area and the location of the crib whether or not this is an old farmstead remnant – there is only a lane connecting the field and this old corn crib. Obviously, it is well kept and important to the owner – and it is wonderful to see the condition it’s in. I’m keeping an eye on this one for future shots and hope to find out who it belongs too perhaps for look inside sometime. The last few barn / crib shots have broken away from the “haze and dullness” of the initial shots – they are in my opinion, more hopeful and cheery – perhaps reflecting my own generally improving outlook with the coming spring and end of winter – who knows… The sunny barns and cribs are probably more generally interesting probably because of the color – In a series… the clear / fog atmospheres seem to focus attention on different aspects – the clear blue sky and clear horizon tend to show a certain “big open space” and start to display a certain kind of vastness, whereas the fog atmospheres generally collapse every attention to the structure for a different effect (fog is definitely more difficult to achieve from a technical point of view – need a lot more practise on that)…. The barn and crib portrait series is becoming a fun obsession of mine to see how close yet (hopefully) not quite the image can get to “nostalgic” and “provincial”… how to avoid the quaint image, yet hint at the same time. This entry was posted in Documentary, Matt Niebuhr - Photography, Photography by Matt Niebuhr - West Branch Studio. Bookmark the permalink.